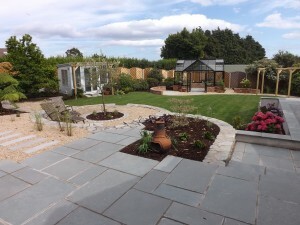 This Contemporary Garden Design transformed a building site into a lovely outdoor room with victorian touches designed to complement the new house. The garden design provides outdoor spaces to be enjoyed during the different times of the day and also makes an attractive vista to admire from within the house on cooler days. 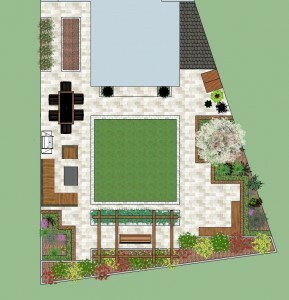 The garden design features a central square lawn, designed to be the same width as that of the family room , which juts out into the garden, highlighted by Portuguese granite cobbles . The lawn is encircled by cream coloured Egyptian limestone paving laid in a soldier course to create a very contemporary clean finish. 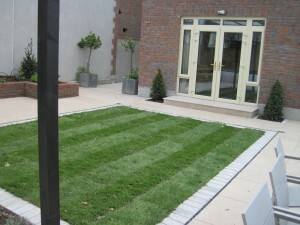 framing the lawn and the surrounding raised borders creating a pattern of rectangular shapes and providing a sharp finish to all areas. 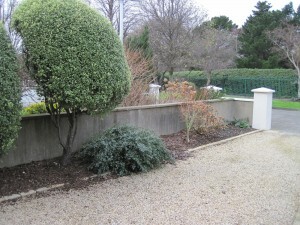 Some of the borders are finished in brick to match the brick of the house and others are plastered and painted off white to add to the contemporary feeling of the garden design. 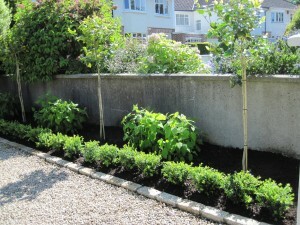 A long raised brick border set against the rear boundary staggers in width along its length and enables the planting of pleached hedging plants to both improve screening to the rear and provide an attractive feature within the garden. The central section of this raised border directly facing the family room features a wooden Pergola overhanging a garden bench positioned centrally relative to the lawn and family room. A narrow border positioned to the rear of the square lawn is filled with lavender and allows the outer beams of the pergola to be clothed flowering climbers. spaces to relax in within the garden, during different times of the day, so that they could enjoy the outdoors whenever possible. 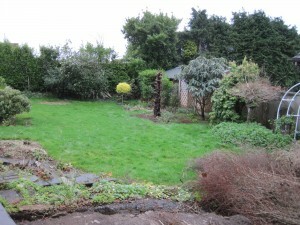 They also wanted a Greenhouse in the Garden Design to enable them to start enjoying growing some plants and vegtables. 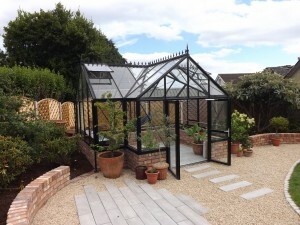 However, they wanted a Greenhouse which was an attractive addition to the garden design and a feature in its own right and although they wanted to enjoy the garden, they wanted it to be manageable. 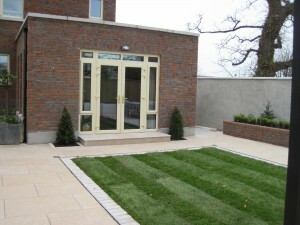 patio to the fore and complemented with brick curving walls on each side. On the opposite side of the garden the slope was transformed into curvaceous terraces finished in decorative gravel and paving to create an attractive yet low maintenance garden feature. Patios extended down the side of the house to create enclosed sheltered spaces for outdoor dining set off by attractive planting. 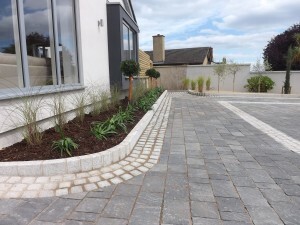 The clients did not want any lawn in the front garden so it was finished in grey block paving detailed in grey granite cobbles and kerbing which provided generous parking areas with good turning spaces. 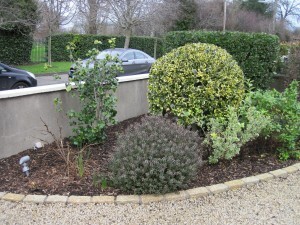 The parking area was encircled with generous borders filled with decorative plants and finished in gravel to reduce maintenance. 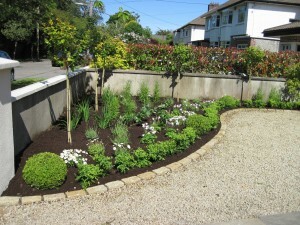 This garden was designed by Garden Design Dublin and beautifully constructed by Exhibition Landscapes. 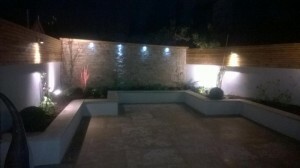 Lighting up the garden at night is now nearly always incorporated into new Garden Design’s. 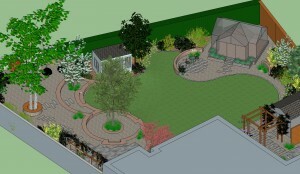 It allows the garden to be enjoyed at night whether from within or when viewed from the house. 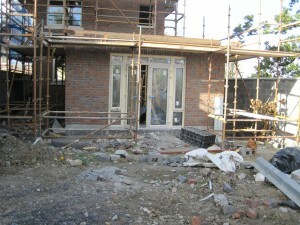 A lot of new houses or extensions to existing houses incorporate large feature windows overlooking the garden, often from wall to wall and ceiling to floor. The garden is then on view completely during the day and night. Garden lighting at night helps to create an outdoor room effect, drawing the house out into the garden and allowing it to be enjoyed all year around. Garden lighting can be used in a number of roles in the garden, for security, safe access, to light up an area for use and for ornamental effect. Security lighting is often triggered by the intruder but the ability to switch off this ability when enjoying the garden at night is essential, otherwise every time you reach for your glass of wine you will be blinded by flood lights. Safe access includes lighting up pathways, driveways, entrances and steps. There are many attractive options available to light up pathways, including bollards and walk over or drive over recessed up lights. Step lighting can be achieved by fixing recess lights into the flanking walls or step risers and there are many options available on the market for this purpose including ones with ‘eyelid’ hoods that hide the light source but still graze the step with light. In order to enjoy the garden at night for dining or BBQ’ing, lighting is required to light up these areas. 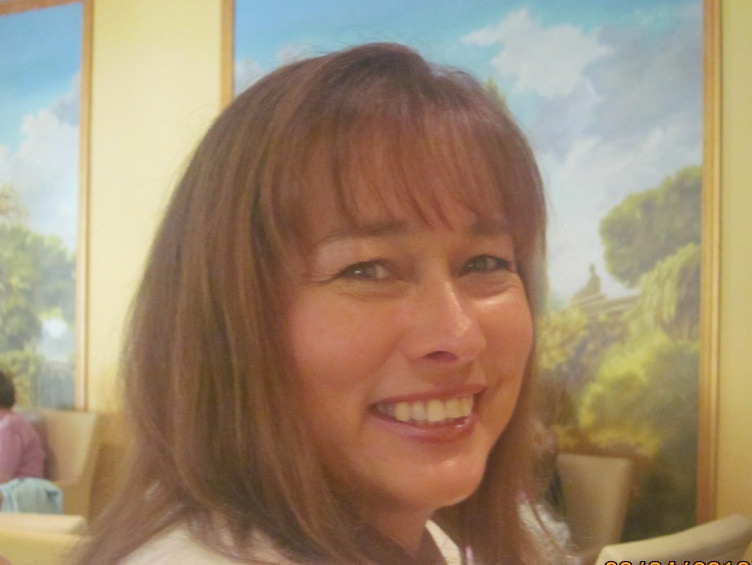 Normally, this is achieved by wall mounted lights on the house or adjacent walls. Finally, to create an atmospheric enjoyable space for outdoor entertainment or just pure enjoyment, ornamental garden lighting of garden features, focal points, plants or trees, patio’s or walls is required. This is achieved by many effects but the main methods are up lighting, downlighting and spotlighting. There is a range of garden lighting products on the market to create these effects. Simple spotlights for lighting up special plants, trees or features which can be moved a little bit to re-position them where needed to create the right effect. Uplighters, downlighters or up/down lighters can be fixed onto walls to highlight either the wall itself or something positioned below or above it. Special mention has to be made about lighting up water features which can involve using underwater lights together with the techniques mentioned above. Finally, introducing colour into the garden via lighting can create wonderful effects and coloured bulbs are available for many fittings these days. Simple white lighting always works well and is a safe bet, however, if you want to branch out my next favourite would be blue which i believe works really well outside and compliments the colour of most plants beautifully. There are also, some un-usual and funky lights for use outside on the market if you want something different! Go on….introduce some garden lighting into your garden and enjoy your garden whether from within our when viewed from the windows of your house.